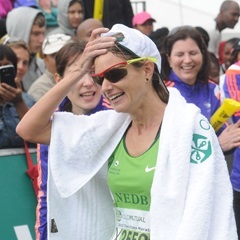 Cape Town - The South African Institute of Chartered Accountants (SAICA) has congratulated Caroline Wostmann on being the first woman over the line of the 2015 Two Oceans Marathon. The 32-year-old Chartered Accountant South Africa [(CA)SA] completed the 56km ultra marathon in a time of 03:41:23 and was the first South African woman to clinch the title in 14 years. Wostmann resides in Pretoria and is a lecturer in finance and management accounting at Wits University. “I trained on my own, but after I did so well in the Comrades last year, I decided to take it more seriously, and engaged Lindsey Parry from the High Performance Centre (HPC) in Pretoria as a coach,” she says. Chantyl Mulder, Executive Director: Nation Building at SAICA, who also enjoys running as a sport, was ecstatic about Wostmann’s win. “Caroline is a shining example of how versatile our members are. Sport is one of the avenues that help to build a nation, and her achievement epitomises what nation building in our profession is all about. SAICA is proud to have such a valuable member in its fold - someone who also embodies the SAICA tenet of responsible leadership. I am sure that this quality will be handed down to her students,” says Mulder.